Information on what this additional funding is and how it is invested in our school. 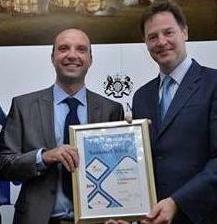 The school was very proud to receive the award from Mr Clegg at Whitehall. We were recognised for the progress of our pupils who are eligible for the pupil premium. The school was presented with a trophy and £10,000 funding. This will be invested in new school resources and research into further improving the outcomes for this body of students. The full list of winning schools can be viewed on web page below. More information can be found on web page below. Pupil Premium Funding and Investment Years 2011-2016 Find out how we spend our pupil premium funding. Longford Park School have delivered a presentation at an "inside government" event for Pupil Premium. This forum was used to share our knowledge and good practice with other schools. The first event was on Wednesday 16th October 2013 and was very well received by those attending. This document details their feedback along with details of the next event that Mr Taylor will attend on Thursday 27th March 2014. We have reached the National Finals of the 2013 Pupil Premium Awards. Nick Clegg the Deputy Prime Minister has written to us with this very exciting news. These awards are given in recognition of the commitment our school has made to raising attainment and maximising the potential of our pupils.